FSU Professor Susan Fiorito accepts the Model Emerging Program Award from the United States Association for Small Business and Entrepreneurship. The Jim Moran School of Entrepreneurship won the award for its innovative approach to entrepreneurship learning. Florida State University’s Jim Moran School of Entrepreneurship has earned the top award in a national competition of entrepreneurship programs. 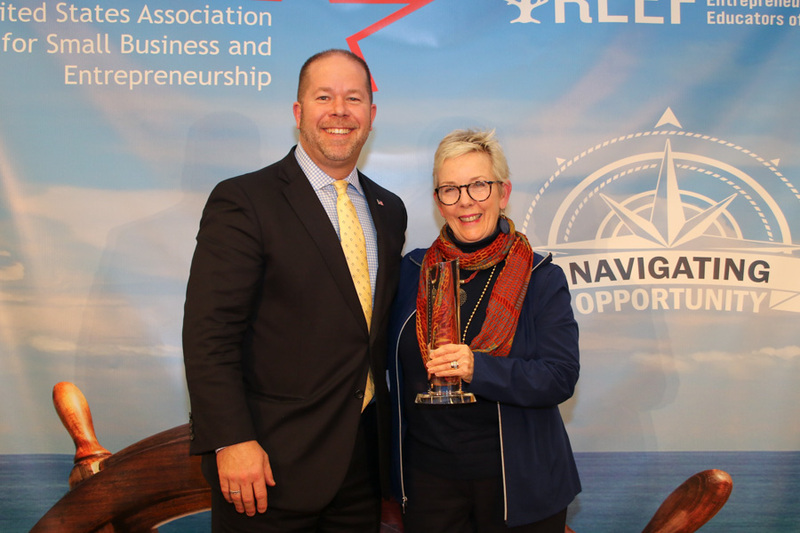 Professor Susan Fiorito, the director of the Jim Moran School of Entrepreneurship, accepted the Model Emerging Program Award from the United States Association for Small Business and Entrepreneurship (USASBE) at the organization’s conference in St. Pete Beach last week. The USASBE Model Emerging Program Award recognizes the efforts of nascent entrepreneurship programs to develop bold, innovative courses that offer students valuable lessons. The competition included nearly 20 entrepreneurship programs that have been created or significantly revised in the past three years. The Jim Moran School of Entrepreneurship started its first classes in fall 2017 with 80 students and two majors. In 2018, the program expanded by accepting 100 new students, offering three majors — commercial, social and retail entrepreneurship — and six minors. It also added 250 retail entrepreneurship students when FSU’s Department of Retail Merchandising and Product Development moved into the Jim Moran School. Students can earn a Bachelor of Science or Bachelor of Arts in entrepreneurship. The curriculum was developed by entrepreneurial faculty and designed to emphasize experiential learning. As an example, students create their own businesses and are encouraged to take risks to maximize the lessons. The main vision is to inspire an entrepreneurial mindset that prepares students for the fast-changing marketplace of the future. The program helps them reach that goal by offering internships, networking opportunities and connections with business mentors. Courses are also offered in London, England; Valencia, Spain; Florence, Italy; the Indonesian island of Bali; and Thailand. The Jim Moran School of Entrepreneurship, which is the nation’s first stand-alone school of entrepreneurship at a public university, provides instruction from 17 full-time faculty members, 16 entrepreneurs-in-residence, 10 experienced adjunct instructors, as well as other faculty members across the FSU campus.